The ESO 3.6-metre telescope (rear) at ESO’s La Silla observatory. 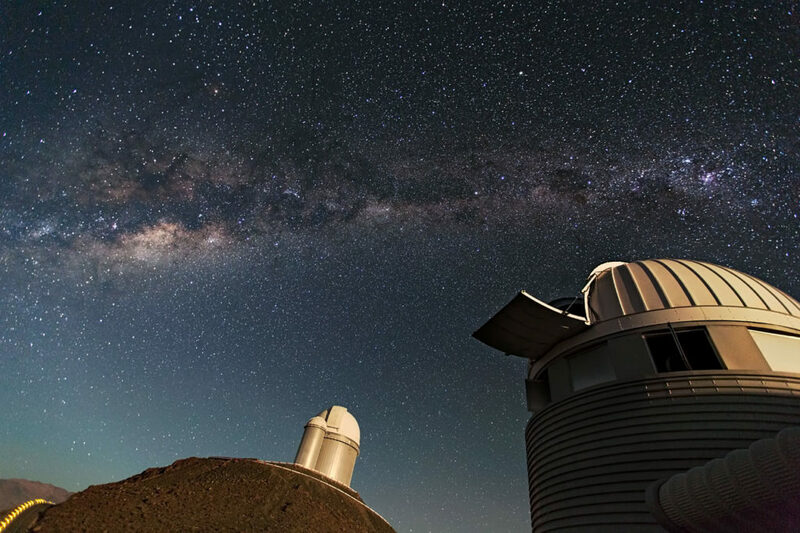 La Silla, in the southern part of the Atacama Desert of Chile, was used for this exoplanet research. Image: ESO. Xavier Dumusque, from the University of Geneva, is part of the consortium that built the HARPS instrument back in 2003 and is a member of the research team who discovered the 20 new planets. “It’s important that we examine the data carefully and make sure we do all the tests we can to make sure we announce bonafide planets and not spurious signals. Because both the planets and the star induce signals, there has been quite a few planets announced which have turned out to be to be false-positives.” says Dumusque. At this moment there’s not much known about the eccentric Jupiter-like planet orbiting HD201782, except its minimum mass, its orbital period, and its eccentricity. However, it is these highly eccentric planets that are interesting because we don’t see any like them in our own Solar System, and their existence implies that something strange has happened in their history. It’s believed that the disks these highly eccentric planets form in are circular; meaning a star or another planet is responsible for getting them into such a highly eccentric orbit. Another star studied was HD 20003, which was found to harbour two Neptune-mass planets with eccentric orbits of 11.9 and 33.9 days, close enough that they gravitationally interact with each other. It is possible that in the past, the two planets were in resonance, which might have increased the eccentricity of the innermost planet until a specific event, such as the presence of additional planet, made the two planets go slightly out of resonance on their current orbit. “We saw 20 more planets orbiting bright and therefore close by stars. Thus the probability of having at least one planet around each star increases. Today, the statistics show at least 50% of stars similar to the Sun have planets.” Dumusque said. The other systems observed were: HD 21693, a system with two Neptune-mass planets close to a 5:2 resonance; HD 31527, a three-Neptune system lying in the habitable zone; HD 45184, a system with two close-in Neptunes; HD 51608 harbouring two Neptune-mass planets; HD 134060, a system with a short-period Neptune on an eccentric orbit with a more massive long-period companion; and HD 136352, a system which has three planets in orbit.